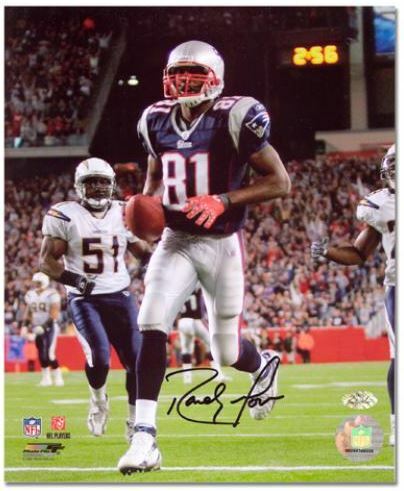 One of the most popular and charismatic players of his time, Randy Moss rookie cards and autographed memorabilia are popular still today. When he retired before the start of the 2013 season, Moss held the record for most touchdowns in a season. He is also second on the career touchdown reception list. Moss is primarily remembered as a member of the Minnesota Vikings and the New England Patriots. A seven-time Pro Bowl selection, Moss racked up numerous awards during his career. 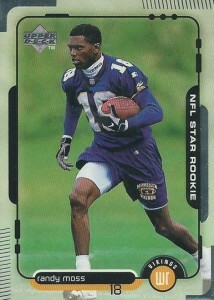 Randy Moss has over 40 rookie cards. They were released in 1998 football products and most are very affordable. Moss has several first-year autograph cards. 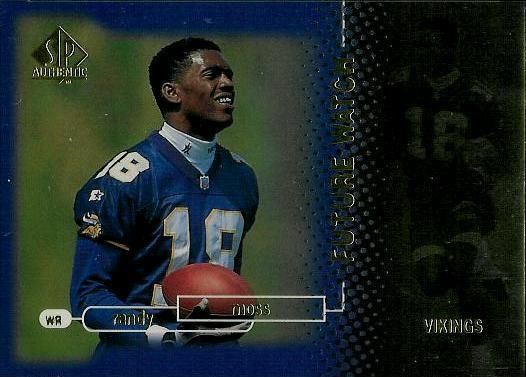 However, most are inserts and aren't generally considered rookie cards. Numerous manufacturers included Moss in their products. Some of his more popular 1998 autographs include those from Bowman and SP Authentic. 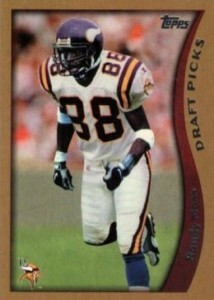 Moss' first game-used memorabilia cards were also issued in 1998. They can be found in Collector's Edge Odyssey. 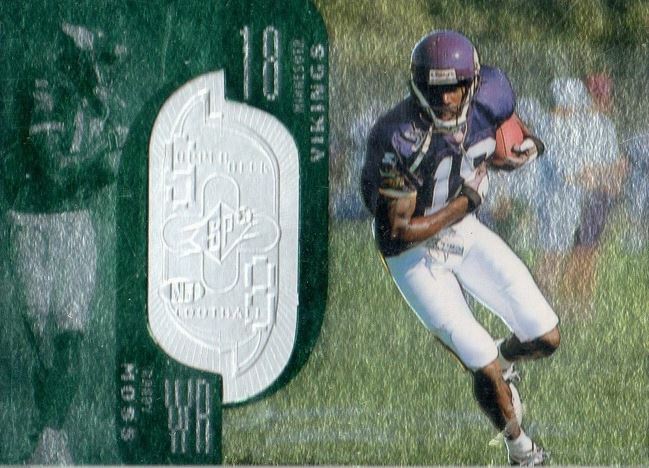 The cards feature a swatch of a game-used football. 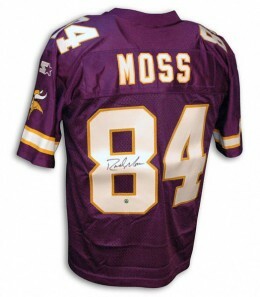 Randy Moss' autographed memorabilia sells for top dollar. Footballs and photographs are the least expensive. 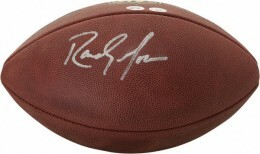 The value of his autographed memorabilia will likely rise if he is inducted into the Professional Football Hall of Fame. Bowman has been a longtime collector favorite when it comes to rookie cards. In addition to the base card, Refractor and a Hometown parallels also exist. 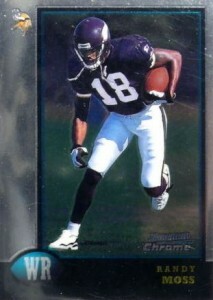 This is Moss' most popular rookie card. Despite lacking a serial number, memorabilia or an autograph, it routinely sells for prices that rival other rookie cards with those features. It is commonly submitted for professional grading. 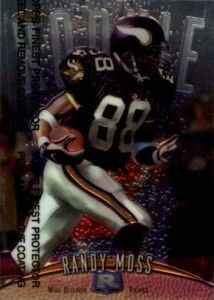 This is one of Moss' most limited rookie cards. It is also one of only two that are serial numbered. The design of the card, with its foil accents and dual image, makes it very popular with collectors. Below you will find examples of what an authentic Randy Moss autograph looks like. This can be used as a first point of reference for determining the legitimacy of autograph memorabilia, but is not a substitute for having your items authenticated by a well-respected professional autograph authentication company. Some of the trusted sources within the sports memorabilia market include the following companies: PSA, JSA, Steiner, Tristar and Mounted Memories. Click on any of the images below to view full size photos. The two most dominant letters are the "R" and "M."
The "R" is formed with a short vertical line and a guitar pick shaped loop that does not connect to that line. A longer horizontal line comes off the end of letter. The "a" is legible and usually has an open loop. The letters "n-d-y" all combine together to form one character. An elongated oval loop, running vertically is visible. A tail dropping below the horizontal plane indicates the "y". The letter "M" is discernible. It start with a left-to-right short horizontal line on an angle. It takes a small rise before dropping into a "u" shape. A longer up and down line resembling an upside down "V" follows. The "o" is open and the "s"s are implied. Vikings Receiver RANDY MOSS Signed Full Size Replica Helmet AUTO - JSA!